Thrombin cleavage of osteopontin controls activation of hepatic stellate cells and is essential for liver fibrogenesis. Liver biopsy is the current reliable way of evaluating liver fibrosis. However, no specific sera biomarker could be applied in clinical diagnosis. As the pivotal role of osteopontin (OPN) reported in numerous liver diseases, thrombin-cleaved OPN (Thr-OPN) exposes an integrin-binding motif that promoted biological functions. Herein, we investigated the potential of Thr-OPN in liver fibrosis. Using patient samples, mouse models and hepatic stellate cells (HSCs), we analyzed the involvement of Thr-OPN in liver fibrosis. The result showed that, first, Thr-OPN level was significantly higher in patients with liver cirrhosis than that in patients with chronic hepatitis B and healthy controls. Thr-OPN level was positively correlated with liver fibrosis degree in clinical samples. Then in mouse models, it showed a similar correlation between hepatic Thr-OPN levels and liver fibrosis degree. Thr-OPN peptides exacerbated liver fibrosis in OPN-deficient mice, whereas the neutralization of Thr-OPN alleviated liver fibrosis in wild-type mice. Furthermore, when compared with full-length OPN (FL-OPN), Thr-OPN exhibited a greater ability to promote HSC activation, proliferation, and migration via mitogen-activated protein (MAP) kinase and nuclear factor (NF)-κB pathways. In conclusion, Thr-OPN, not FL-OPN, was critically involved in the exacerbation of liver fibrosis by α9 and α4 integrins via MAP kinase and NF-κB signaling pathway, thus representing a novel diagnostic biomarker and treatment target for liver cirrhosis. Osteopontin is up-regulated and associated with neutrophil and macrophage infiltration in glioblastoma. Osteopontin (OPN) is a glycophosphoprotein with multiple intracellular and extracellular functions. In vitro, OPN enhances migration of mouse neutrophils and macrophages. In cancer, extracellular OPN facilitates migration of cancer cells via its RGD sequence. The present study was designed to investigate whether osteopontin is responsible for neutrophil and macrophage infiltration in human cancer and in particular in glioblastoma. We found that in vitro mouse neutrophil migration was RGD-dependent. In silico, we found that the OPN gene was one of the 5% most highly expressed genes in 20 out of 35 cancer microarray data sets in comparison with normal tissue in at least 30% of cancer patients. In some types of cancer, such as ovarian cancer, lung cancer and melanoma, the OPN gene was one of those with the highest expression levels in at least 90% of cancer patients. In glioblastoma, the most invasive type of brain tumours/glioma, but not in lower grades of glioma it was one of the 5% highest expressed genes in 90% of patients. In situ, we found increased protein levels of OPN in human glioblastoma versus normal human brain confirming in silico results. OPN protein expression was co-localized with neutrophils and macrophages. In conclusion, OPN in tumours not only induces migration of cancer cells but also of leucocytes. Atai NA, Bansal M, Lo C, et al. Osteopontin is up-regulated and associated with neutrophil and macrophage infiltration in glioblastoma. Immunology. 2011;132(1):39-48. Osteopontin aggravates experimental autoimmune uveoretinitis in mice. Human endogenous uveitis is a common sight-threatening intraocular inflammatory disease and has been studied extensively using a murine model of experimental autoimmune uveoretinitis (EAU). It is possibly mediated by Th1 immune responses. In the present study, we investigated the role of osteopontin (OPN), a protein with pleiotropic functions that contributes to the development of Th1 cell-mediated immunity. Accompanying EAU progression, OPN was elevated in wild-type (WT) mice that had been immunized with human interphotoreceptor retinoid-binding protein (hIRBP) peptide 1-20. OPN-deficient (OPN-/-) mice showed milder EAU progression in clinical and histopathological scores compared with those of WT mice. The T cells from hIRBP-immunized OPN-/- mice exhibited reduced Ag-specific proliferation and proinflammatory cytokine (TNF-alpha and IFN-gamma) production compared with those of WT T cells. When hIRBP-immunized WT mice were administered M5 Ab reacting to SLAYGLR sequence, a cryptic binding site to integrins within OPN, EAU development was significantly ameliorated. T cells from hIRBP-immunized WT mice showed significantly reduced proliferative responses and proinflammatory cytokine production upon stimulation with hIRBP peptide in the presence of M5 Ab in the culture. Our present results demonstrate that OPN may represent a novel therapeutic target to control uveoretinitis. Kitamura M, Iwabuchi K, Kitaichi N, et al. 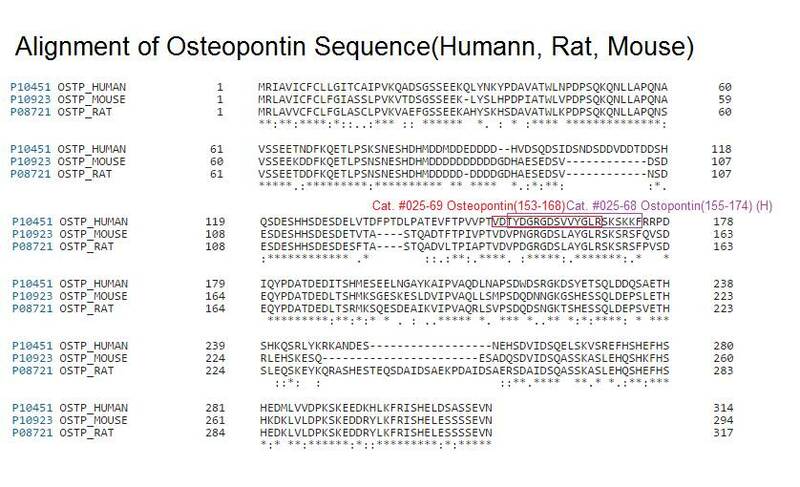 Osteopontin aggravates experimental autoimmune uveoretinitis in mice. J Immunol. 2007;178(10):6567-72. Proangiogenic functions of an RGD-SLAY-containing osteopontin icosamer peptide in HUVECs and in the postischemic brain. Osteopontin (OPN) is a phosphorylated glycoprotein secreted into body fluids by various cell types. OPN contains arginine-glycine-aspartate (RGD) and serine-leucine-alanine-tyrosine (SLAY) motifs that bind to several integrins and mediate a wide range of cellular processes. In the present study, the proangiogenic effects of a 20-amino-acid OPN peptide (OPNpt20) containing RGD and SLAY motifs were examined in human umbilical vein endothelial cells (HUVECs) and in a rat focal cerebral ischemia model. OPNpt20 exerted robust proangiogenic effects in HUVECs by promoting proliferation, migration and tube formation. These effects were significantly reduced in OPNpt20-RAA (RGD->RAA)-treated cells, but only slightly reduced in OPNpt20-SLAA (SLAY->SLAA)-treated cells. Interestingly, a mutant peptide without both motifs failed to induce these proangiogenic processes, indicating that the RGD motif is crucial and that SLAY also has a role. In OPNpt20-treated HUVEC cultures, AKT and ERK signaling pathways were activated, but activation of these pathways and tube formation were suppressed by anti-αvβ3 antibody, indicating that OPNpt20 stimulates angiogenesis via the αvβ3-integrin/AKT and ERK pathways. The proangiogenic function of OPNpt20 was further confirmed in a rat middle cerebral artery occlusion model. Total vessel length and vessel densities were markedly greater in OPNpt20-treated ischemic brains, accompanied by induction of proangiogenic markers. Together, these results demonstrate that the 20-amino-acid OPN peptide containing RGD and SLAY motifs exerts proangiogenic effects, wherein both motifs have important roles, and these effects appear to contribute to the neuroprotective effects of this peptide in the postischemic brain. Lee H, Jin YC, Kim SW, Kim ID, Lee HK, Lee JK. Proangiogenic functions of an RGD-SLAY-containing osteopontin icosamer peptide in HUVECs and in the postischemic brain. Exp Mol Med. 2018;50(1):e430.